Collins Booksellers - Great Indian Meals – 25 Food Serving Places in Delhi: Reviewed, Discussed & Dissected To The Last Bite by RG, 9781533753519. Buy this book online. 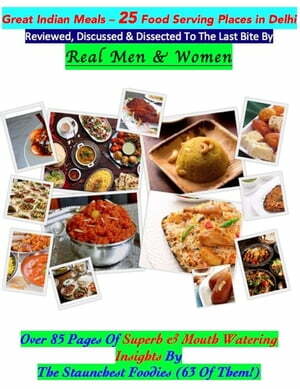 Over 85 Pages of thoroughly done reviews by the staunchest foodies from the capital city of India. Within India, Delhi has become the hub of tourist attraction primarily because of the its ancient monuments, its strong history & most importantly The Variety of Food one gets in Delhi. Over 60 true blue foodies have given a comprehensive take on 25 restaurants & take-away joints in Delhi. The reviews are objective in outlook, neutral in view & the lingo used is quite contemporary. So, if you are planning a visit to Delhi, you have to go through the 1st Volume Of This Series which will be followed by the 2nd Volume & so on & so forth with a list of completely different restaurants & take-away joint, not a single joint will overlap in between volumes! We plan to review over 400 food-serving places in Delhi itself! Isn't that Amazing! We want to make it easy for the tourist. Cheers!